We draw on objective clinical data to form a gum disease diagnosis and to grade the condition. The small collar of gum around each tooth usually sits 2-3 millimeters deep, a small crevice easily cleaned by floss or toothpicks. Dr. Kari Mann or our hygiene team can measure and chart multiple areas using a small measuring device. If these measurements register beyond 3 millimeters and include bleeding areas, the disease is present. Deeper findings indicate more advanced disease than shallower readings. Dr. Kari Mann will also consider the texture and shape of your gums, and any movement detectable in each tooth. It's also vital to examine the levels, shape, and density of the bone around your teeth on digital x-rays. 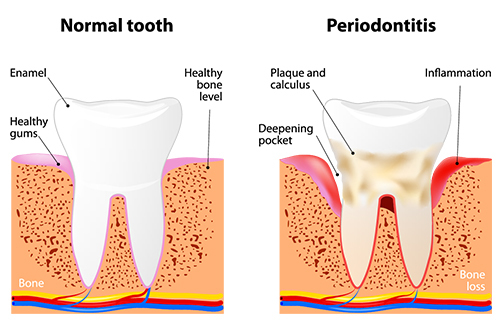 By drawing together numerous findings, a clear picture forms about your gum condition. Dr. Kari Mann may suggest a medicated rinse, an electric toothbrush, a Waterpik, or other specific strategies to help you with your ongoing efforts. Remember, gum disease can be controlled but not cured. Dedicated daily efforts must be consistent to control the disease.